There are those nights when you visit a restaurant and things just go wrong. This was not one of those nights - in fact, the exact opposite. And in a city where I believe restaurants are expensive, it is gratifying to know there are places where you seem unlikely to be disappointed. 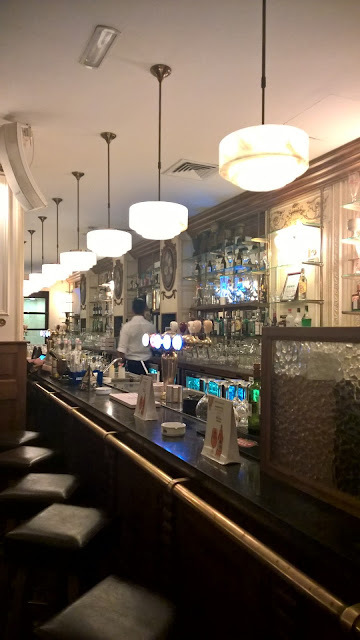 The Belgian Cafe, as I discovered on my recent visit, seems to be one of those, judging from many regular guests who make this their first choice for a gastro pub experience - a cafe that was 'gastro' long before the gastro pub rage emerged last year in Abu Dhabi. While my guest and I are tempted to sit indoors to experience that authentic Belgian Cafe atmosphere thanks to its very classical European setting, the allure of the outdoor terrace is too great, and we succumb to the call. The feel of the chilly breeze is really hard to resist, especially when we consider that in a month and a bit the unrelenting Summer heat will be upon us. Views of the marina and a packed terrace allow us to deal with the surprisingly extra cool weather. A perusal of the new menu items makes me feel right at home at Belgian Cafe - this place, I tell my host, is much more than beer. A couple items catch the eye immediately. We order the Tuna tartar and Steak tartar and for a bit of balance, we get the Walnut and Roquefort Cheese salad. Our starters, as they are served, confirm what I felt earlier which is that the Belgian Cafe offers something for everyone. I am admittedly not a pub crawler, but as I see the dishes, I feel right at home. The laughter and conversation, meanwhile, create a genuine cafe atmosphere, and I have moments when I feel I am not in Abu Dhabi. 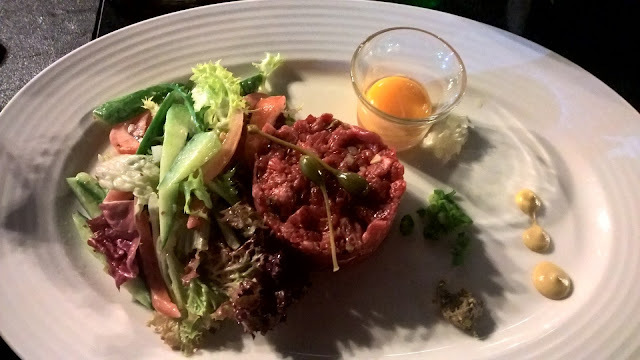 The Steak tartar is a healthy portion, and I like the way it is served, allowing guests to see what it looks like before they jump in and mix all the ingredients. It is a classic tartar, and I strike it lucky and get the balance with the tabasco just right. 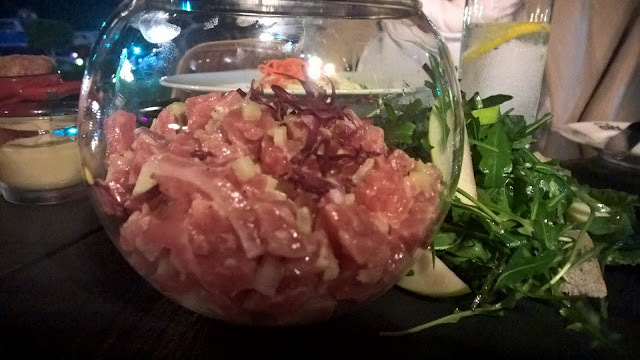 As for the other starter, the Tuna tartar, it too strikes a chord with its simple but eye-catching presentation. A large vase-like bowl allows us to see what is inside. When I try it, the word 'classic' pops into my head again. 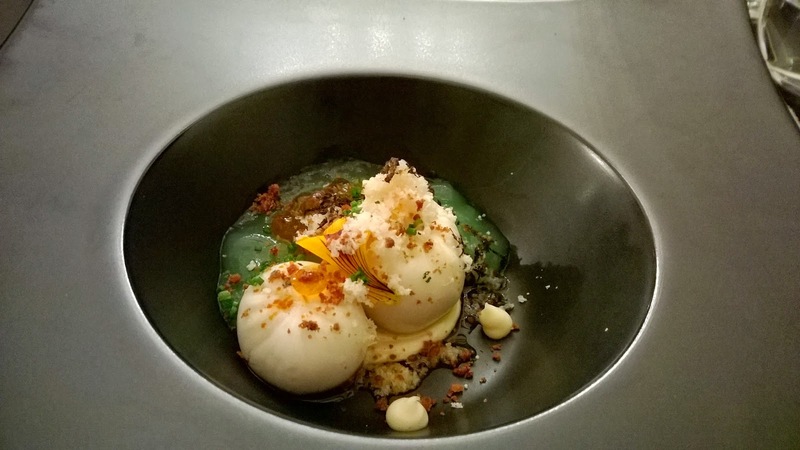 It is soon evident that Sous Chef Jost Christoph, while willing to play around with his presentation, is religious about keeping the taste true to its origins. Nice. Finally, the salad is a must-try. Roquefort cheese can be overpowering, but if used cleverly, can be a perfect foil for the other ingredients, something Chef achieves with his walnuts and green apple. 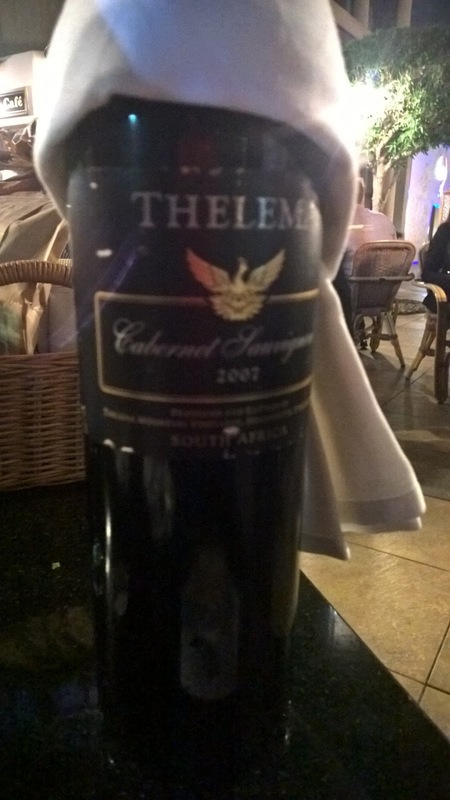 Having finished off a glass of Prosecco, we order a 2007 Thelema Cabernet Sauvignon from a fantastic range of promotional wines - at more than half the price, I jump at the opportunity. This wine from a small Stellenbosch winery, is a deep ruby red wine with a rich and dark nose that is full on the palate. I was initially worried that it may have aged too much, but it turns out to be perfect. At around 250AED and more than 50% off the original price, you will not find a better tasting wine at that price! 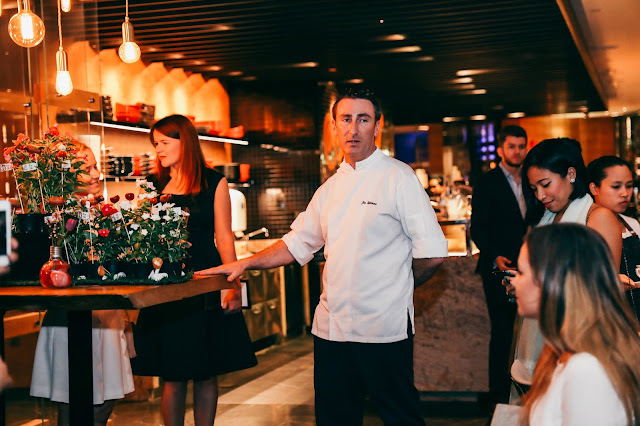 After some excellent appetisers, we follow Executive Chef Danny's recommendation, and order the Wagyu burger and Rack of lamb, apparently two of the must-have dishes on the menu. 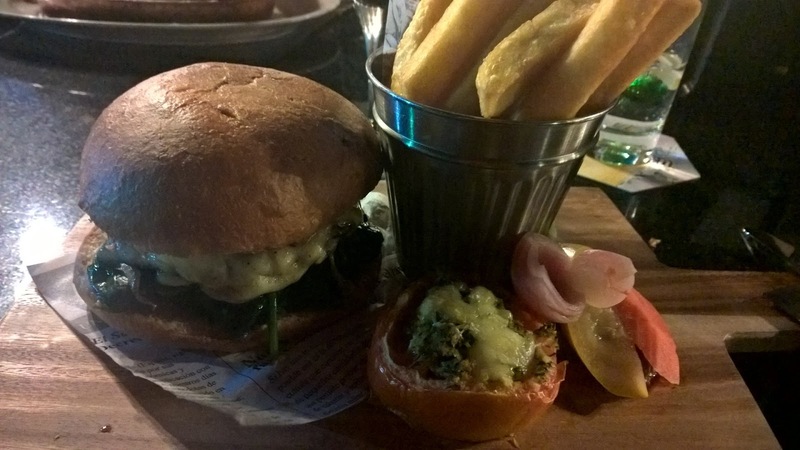 I am assured on two fronts that the burger is likely to be the best I have had - quite a bold statement considering I see myself as a bit of a burger nut, but when I bite into it, with eyes fixed on me, waiting for a reaction, I take another bite. Simply wow! Where do I begin? There's a slice of foie gras to bring that unmistakable taste, but for me, it is more the textural contrast that I find arresting. Of course, the cheese is something to write about in its own right - Chef has used Chimay cheese, a Belgian cheese that is less pungent than similar cheese but full of more character than typical burger cheese. Delicious. Underneath the beautifully cooked wagyu - medium well as per my request - is a bed of spinach. Yes, spinach. Herein lies the homely element in this super burger. Finally, onion syrup brings a wonderful sweetness to the burger, while the fig brioche adds even more texture. And what does the joint- best burger I have now tried in Abu Dhabi cost? 91AED++, cheaper than anything gourmet I have tried. I never thought I would describe an experience with a burger as intense, but that is what it was! 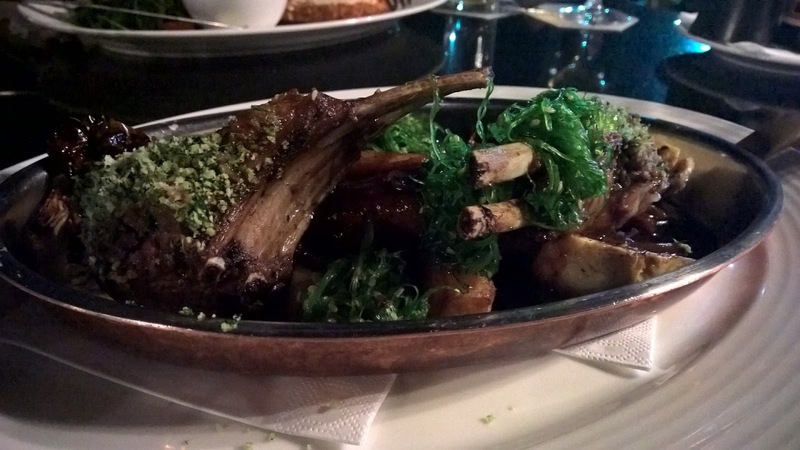 As for the lamb, it too is a highly enjoyable dish. It is a hearty and simple dish. How can I describe it? It is like something I would have at home in my mother's kitchen. There is that aspect to it. Overall, it is succulent, tender and lightly seasoned, a lightness broken when I get to the meat close to the bone where all that flavour bursts through. Superb! 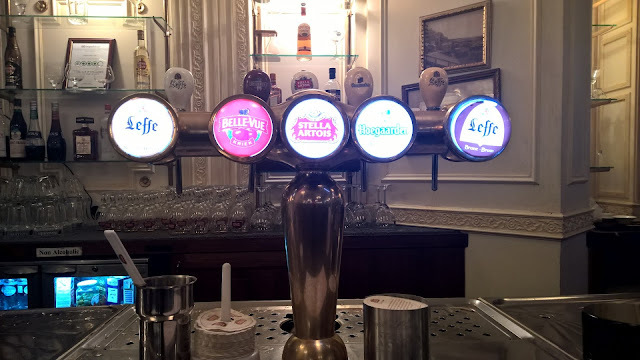 Belgian Cafe really surprised me. Having tried it before at another outlet, I arrived here knowing what I would get and adjusting my expectations accordingly. Don't you love it though when you walk away from a restaurant or cafe and go, 'Well this surpassed all my expectations!' This is exactly what happened. Beer is certainly a big part of the concept, but for me it is by no means the quintessential element of this Belgian Cafe. This could be seen, for example in the new menu items and wine list. I was also surprised by the prices. It was like having a high-end experience but in a relaxed almost non-hotel like environment with prices to match. A memorable evening and a paradigm shift within me! Disclaimer: I consult at restaurants and hotels in an attempt to look at the entire product to take service levels to where they should be. 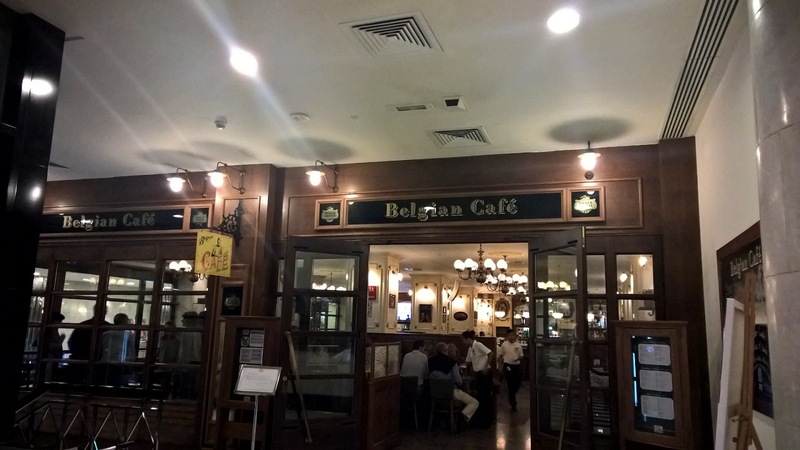 I visited The Belgian Cafe courtesy of the hotel.